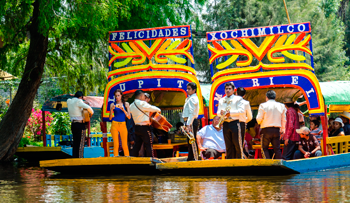 Boat ride on a “trajinera” (a typical small barge) through the canals of Xochimilco which have been there since pre-Hispanic times and the site of the “floating gardens”. Xochimilco was the place where Toltec people found shelter after the fall of Tula, and its residents have worked the land from ancestral times prior to agriculture. It is a traditional place where many Mexicans go for family outings. Then, a visit to Mexico’s National University, the most important education institution in the country, built in the fifties but which foundation dates back to the XVI century. Tour of the campus with its over 80 buildings, among them the Administration, the Library, the Olympic Stadium, among other.